“You’ve got this franchised, right?” The director of a prominent mission school in Southeast Asia was holding copies of Xplore and Go Mobilize and wondering if he could afford to use these CMM discipleship tools with his students. Jason and Ryan, members of the CMM’s Southeast Asia Catalytic team, had just met this man, who is leading the institution and preparing the next generation of goers from the region. They smiled and said, “No, they are free to download and use however you like.” His disposition immediately changed, and suddenly the conversation shifted to how the CMM could partner with the school and create a new module that would incorporate mobilization training for every student. Like this mission school, the CMM is committed to seeing laborers raised up to take the gospel to the unreached. In Southeast Asia, where Ryan and Jason serve, there are still more than 330 million unreached people who have never heard the gospel message. With tens of millions of Buddhists, Hindus, Muslims, and animists throughout the region, it is one of the most religiously diverse parts of the world. But Southeast Asia is also home to a large and growing evangelical church. With tens of millions of evangelical Christians throughout the region, Ryan and Jason have found that the theme of mission mobilization is as relevant as ever. For this reason, they feel privileged to be “servant partners” with their counterparts in the process of mobilization. The Southeast Asia team has been overwhelmed with the level of professionalism and passion they encounter with these fellow mobilizers. Everywhere they go, they meet people who self-identify as mission mobilizers. From Hong Kong to Hanoi, and Malacca to Manila, mobilization is on the minds of church and mission leaders. Because mission mobilization is well known and practiced in the region, Ryan and Jason are constantly learning about innovative ways mobilizers are inviting others to participate in mission. For example, one mobilizer in Indonesia is incorporating principles of disciple-making movements into his mobilization strategy. He’s not only seeing people raised up and sent out to the unreached, he is also multiplying himself by raising up more mobilizers. In the Philippines, another mobilizer is teaching lessons from Xplore online to Filipino workers in the Arabian Peninsula. They are gaining a heart for the nations from a closed country! 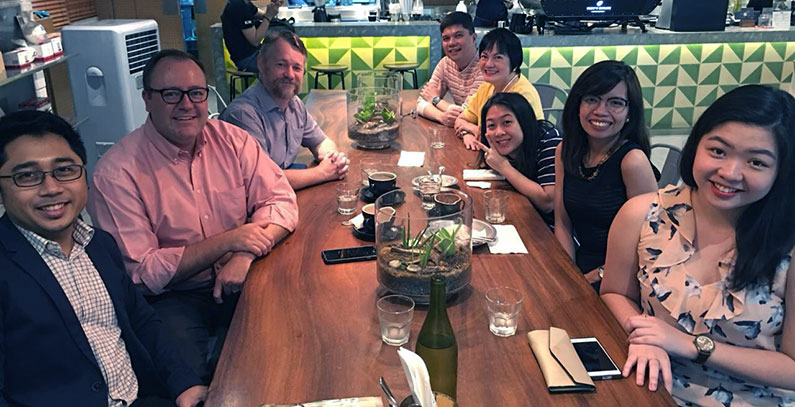 A mission agency in Singapore is using Xplore as a way to build relationships and help local Christians learn about the mission of God. Through all of this, the CMM has learned that relationships matter. Our teams are committed to standing shoulder to shoulder with local mobilizers as we strive together to see more laborers sent out into the Lord’s harvest. But Ryan and Jason are quick to point out that these local leaders are not merely CMM ministry partners, but friends and allies as well. In the coming months, our Southeast Asia Catalytic team will follow up with the leaders of the mission school as they incorporate Xplore and Go Mobilize into their training program. But more importantly, CMM team members will be working to deepen this relationship and the many others throughout the region. It is a joy to serve these local ministries and help them invite others into the Great Commission.